Nexen – Real Marketing Ltd.
Nexen continuously monitors its products and services for both performance and customer satisfaction. The company aims to be the first choice provider in the forklift industry by delivering the best performing products with the best possible quality at highly competitive prices. Nexen’s FDL20-FDL25 diesel counter-balanced forklifts offer quick and easy forklift servicing & maintenance. The latest appearance trends were used in the design of the Libero range to create a truck that has a fluent and aesthetic outline. Thanks to the long wheelbase design, the longitudal stability of the whole truck is much improved, the hoisting capacity at the same lift height are enhanced by an average of 100kg. At the same time, it prolongs work life of the rear wheels due to the reduced rear axle load. Increasing the proportion of rigid hydraulic pipes and utilising right angle and straight through connectors reduces the pressure loss of the pipeline, in turn raising the lifting speed of the mast. A 10% speed increase has been noted on average compared with the previous model. Turning radius and width of right angle stacking aisles are decreased by reducing the dimensions of the whole truck, which in turn can provide better efficiency for your warehouse. Nexen’s FDL30-FDL35 diesel counter-balanced forklifts offer quick and easy forklift servicing & maintenance. Our Libero FDL30-FDL35 series forklift are combined with both durability and ergonomics, providing productivity rivaling other leading forklifts and maintaining comfort for hours of tireless operation. Add friendliness to the environment, simple servicing, efficiency on the job, high standards of safety- its the perfect tool for even the most demanding of applications. The transmission can be chosen among Okamura and NISSAN with advanced structure and dependable function. Among them, the Okamura transmission adopts advanced float type structure which can achieve a flexible connection between engine and frame, the vibrations of transmission to frame is reduced. The diesel engine provides great power, economical fuel consumption and dependable functions. Nexen’s FDL50-FDL70 diesel counter-balanced forklifts offer quick and easy forklift servicing & maintenance. Our Libero FDL50-FDL70 series forklift are combined with both durability and ergonomics, providing productivity rivaling other leading forklifts and maintaining comfort for hours of tireless operation. Add friendliness to the environment, simple servicing, efficiency on the job, high standards of safety- its the perfect tool for even the most demanding of applications. Nexen’s FGL20-FGL25 LPG counter-balanced forklifts offer quick and easy forklift servicing & maintenance. Environment friendly engines all meet EU stage-II emission control regulations. Noise emission also comes up to EU standards. The metal hood and moulding sound insulation matches environmental protection demands. Nexen’s FGL30-FGL35 LPG counter-balanced forklifts offer quick and easy forklift servicing & maintenance. 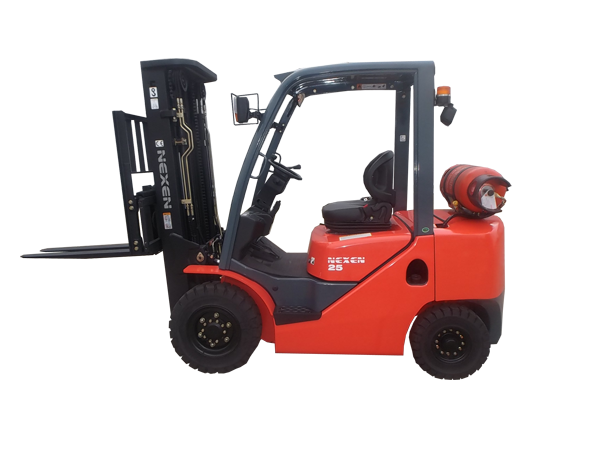 Our Libero FGL30-FGL35 series forklift are combined with both durability and ergonomics, providing productivity rivaling other leading forklifts and maintaining comfort for hours of tireless operation. Add friendliness to the environment, simple servicing, efficiency on the job, high standards of safety- its the perfect tool for even the most demanding of applications.